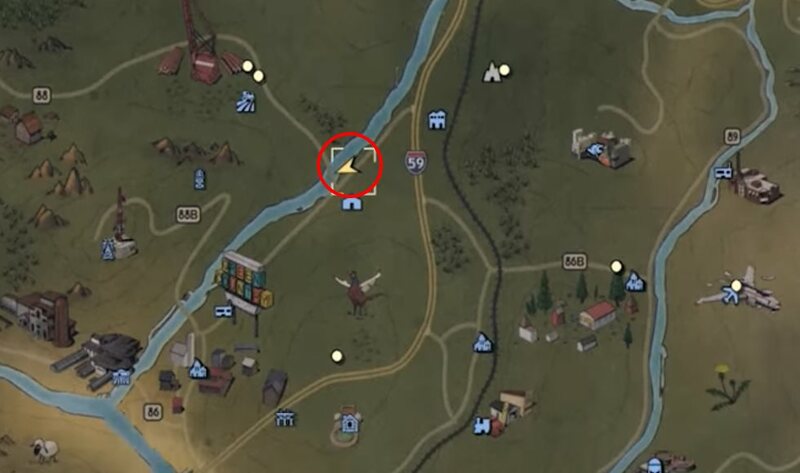 Go to Point Pleasant (west of Vault 76, where the Mothman Museum is). 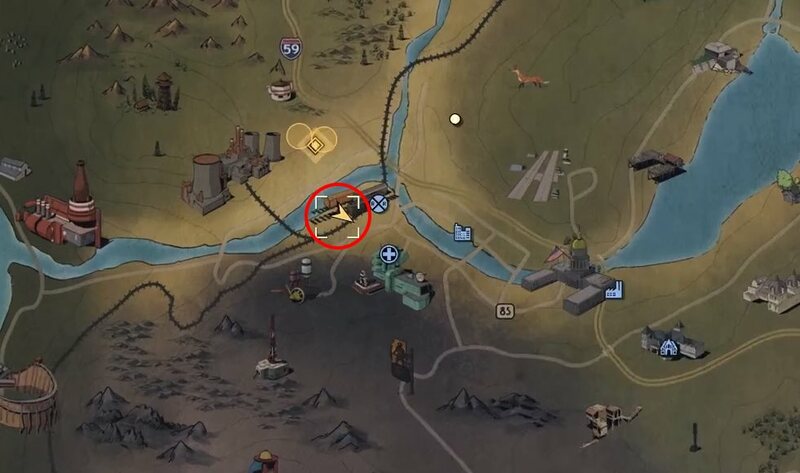 The bridge on the treasure map is not the big bridge that spans the river, but a smaller one further south, which leads over a smaller river that flows into the big one. When you have found the bridge, you jump down south of it, look to the north, where you will see a mound. Here you will find the treasure. 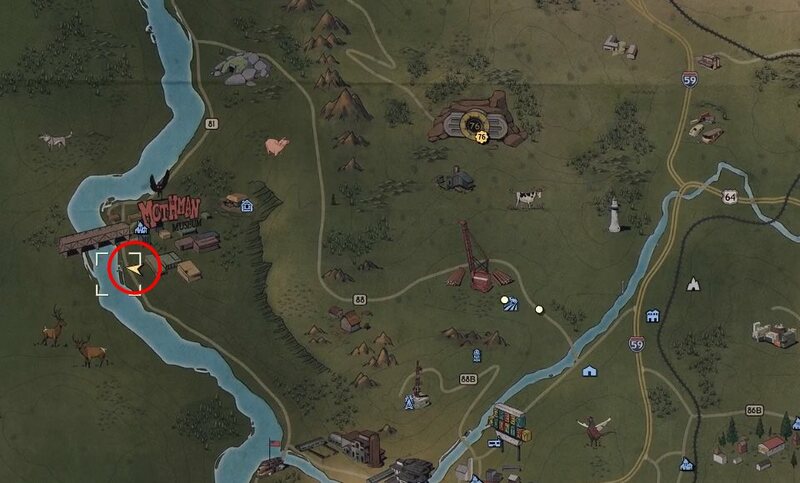 You can find the place you are looking for on this treasure map north of the Poseidon Energy Plant near Camp Adams. Once at the tower, keep southwest until you reach a small campsite. Find the mound with the treasure in the hearth. To find this treasure, you start at the Relay Tower HG-B7-09. From there, keep to the north, go over the hill and then have a good view of the power plant. Now go down, looking for a playground. You can find the treasure there under the climbing frame. 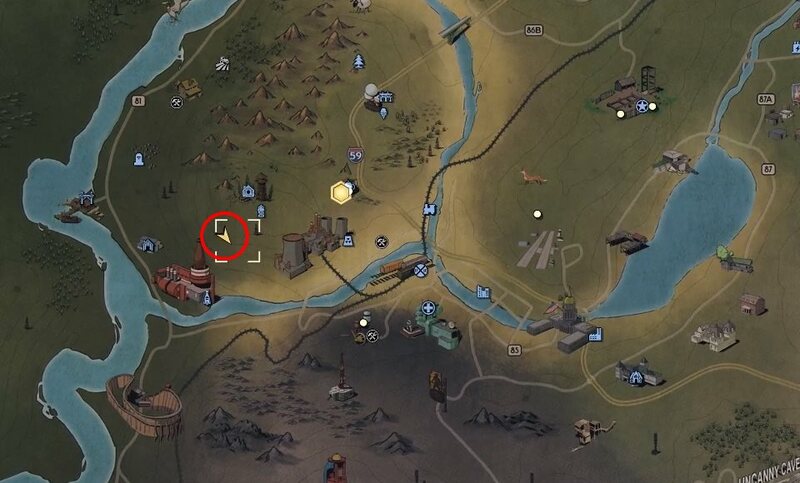 This treasure map will take you to the Anchor Farm northwest of Vault 76. Just follow the road towards the Ferris wheel. After the two sharp turns, look around and you will see the farm in the form of a yellow house. Walk around it and in the garden on the back you will find a plane. The mound with the treasure can be found on the left side of the plane. This treasure can be found at the Charleston Trainyard, near the boundary between The Forest and Ash Heap. Enter the Trainyard from the west. Near the river you will find a tilted railroad car. In front of his door is the pile of earth with the treasure. This treasure map will take you near the Overseer’s camp south of Vault 76. Go into the camp and look towards the river. There you will see a wooden bridge. Cross it, then turn around and position yourself to take the angle of view chosen on the treasure map. Slanted left on the other side of the bank you will find the mound with the treasure. This treasure can be found in Widow’s Perch in the south, west of Uncanny Caverns. Here’s a big billboard. You find the mound with the treasure to the right of it (if you look from behind on the blackboard). You will find this treasure southeast of Vault 76 near the point where the railway line crosses the river. This bridge can be seen on the treasure map – if you stand on the bridge and look to the southeast, that is exactly the point of view. The mound of treasure can be found on the south side of the river. To find this treasure, head to Summersville (on the lake in the south of the area). In the south of the city you will find an orange bus on the street. When you found it, you turn towards the city and then go to the first house on the right. The treasure can then be found in the pile of leaves in front of the broken grid under the porch. This treasure can be found near Gregg’s Mine Supply, southeast of Vault 76. If you enter the city from the south, stop and turn right towards the river. Stand over the place where the river goes underground and look into the distance. You see the mound with treasure on a ledge.